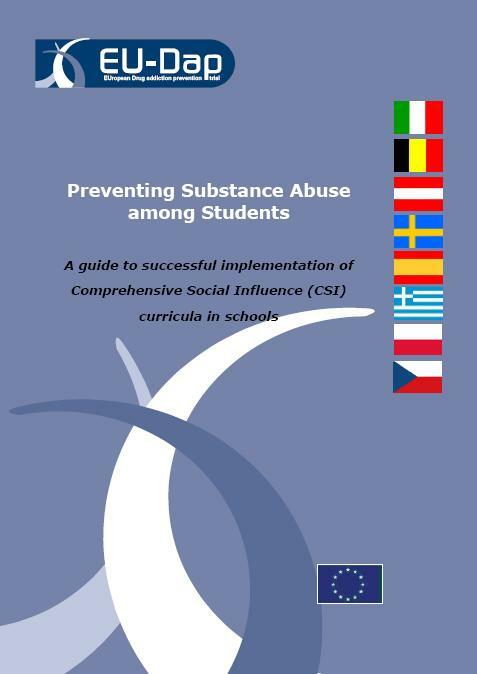 The Intervention Dissemination Group developed a dissemination guide, namedPreventing Substance Abuse Among Students, and designed the evaluation of the effectiveness of the Guide in increasing the adoption of CSI programs in the European schools. The Guide is written with three audiences in mind: national and local authorities, principals and teachers. Composed of five parts, this guide provides information on implementing Comprehensive Social Influence (CSI) curricula in schools. The first part consists of an introduction which reviews the EU-Dap trial and explains better practices in preventing tobacco, alcohol and other drug use among adolescents. The next three chapters are dedicated to the respective audiences. Each chapter provides relevant and practical information to identify and overcome barriers in order to effectively implement CSI curricula in schools. The final part is resource toolbox. Preventing Substance Abuse Among Students is a guide to successful implementation of Comprehensive Social Influence (CSI) curricula in schools. Written by the EU-Dap consortium, this guide has three sections for national and regional authorities, principals and teachers.